I’m honored to be here with President Tessier-Lavigne and Secretary Shultz, who has supported the World Bank Group for decades. And, of course, it’s a great honor to be here with Secretary Rice. Two former Secretaries of State for one speech – that's a first for me, and I am humbled by their presence. One of my heroes, Dr. Martin Luther King, Jr., spoke about poverty here at Stanford in April of 1967, during a time of disruption. The '60s were a time of turmoil in America and the world. He said, "[The struggle today] is much more difficult because we are struggling now for genuine equality. It’s much easier to integrate a lunch counter than it is to guarantee a livable income and a good, solid job." Concerns over livable incomes and solid jobs are what we face every day at the World Bank Group, especially in today’s era of technological change. How are we going to provide opportunities for the poorest and most vulnerable? What’s the role of technology in helping make that happen? Technology can help tackle the most pressing global challenges of our time, but it also poses new risks – from cybersecurity to data privacy. We’ve made understanding disruptive technology and learning from places like Silicon Valley a central priority. That’s why I’ve come to Stanford today. Then we had to decide, how are we going to get there? How are we going to end poverty and boost shared prosperity? We came up with three ways. First, is to grow economies – and this is probably the most well-known work of the World Bank Group. We want equitable, sustainable economic growth. Second, foster resilience against climate change, resilience against pandemics, resilience against migration, and resilience for individuals, which includes social protection. Third, invest in people. We now understand much more clearly that health and education are far more significant for economic growth than we had ever appreciated. And in the middle of all of this is technology. What is the role of technology to help us move forward on all three fronts? I want to give you a picture of what poverty looks like in the world: 736 million people still live in extreme poverty – that's living on less than $1.90 a day. But 25 percent of the population lives on less than $3.20-a-day, which is the poverty limit, or index, in many countries. And almost half of the world lives on less than $5.50 a day. So, what does that look like? With the help of one of our partners, the Gapminder Foundation, we interviewed several families living at these income levels. Here are three of them. The first is the Alimata family. They live in the Centre Region of Burkina Faso. Guebre, 35, sells clothes, and his wife, Yoni, 22, sells bread. Together, the couple works about 103 hours a week. They live with their two children in a single-room home that they built themselves. The house has no electricity and no toilets. Nearly all of the family income, almost 100 percent, is spent on food. They're hardly able to save any money. Guebre and Yoni spend three-and-a-half hours every week collecting water from a source nearby, and they use charcoal and wood as fuel for their stove. They have never been on a vacation. The next thing they plan to buy, if they have the money, is clothing. They hope that one day they'll be able to buy a motorbike. That would completely transform their prospects for income. Now, this is what it looks like to live on less than $3.20 a day. Kalu Ram and Kherun Nisha live in Jaipur, India. They own a shop where they sell kachori – a spicy deep-fried snack. They received a loan from IFC client Equitas to open the shop, and it doubled their income. Families at this income level have homes made of stone or burnt brick. They are likely to have electricity and a water tap. At this income level, people can afford sandals, and they might own a cookstove. They probably own a cell phone, and they might have a small TV. When this photo was taken, we asked Kalu and Kherun what their hopes were. They wanted to buy a bike for their child. So, beyond just subsistence, they thought that giving their child something beyond the bare necessities would be the next thing they would do. This is what it's like to live on less than $5.50 a day. The Poma family lives in the La Paz region of Bolivia. Juan, 43, is a carpenter. He and his wife, Eulogia, have five children. The family lives in a two-bedroom home that sits on a dangerous hill, but they enjoy the view and the security of owning a home. Electricity is stable, and they cook on natural gas appliances. The family purchases all of its food, using about 80 percent of Juan's income. Safe drinking water and a toilet are available in the yard. Juan has never been on a vacation, but he has traveled as far as the Bolivian border. His favorite possession is the television. Soon, he would like to purchase better walls for their home, and his dream is to own a refrigerator. These three families represent how more than half the population of the world lives. Adding to this picture of poverty, this is what I see nearly everywhere I go: people on smartphones and on the internet. Some predict that, as soon as 2025, all 8 billion people on earth will have access to broadband. They will probably have access to a smartphone, if they don't own one themselves. At the World Bank, we studied the implications of what this means for our twin goals. The first thing that happens when you get access to broadband is your satisfaction with life goes up. You get to communicate with people. In some countries, even poor countries like Kenya, you can send money back-and-forth. The other thing that happens is your reference income – the income to which you compare your own – goes up. Our research shows that, on average, if someone’s reference income goes up 10 percent, their own income has to go up 5 percent in order for them to have the same level of satisfaction. But, when we focus on the bottom 40 percent of the income distribution, if their reference income goes up 10 percent, their own income has to go up 20 percent just for them to preserve the same level of satisfaction. This is happening everywhere. Aspirations are going up – and that’s a great thing. I was born in Korea when it was one of the poorest countries in the world, and my family was able to take advantage of so many opportunities. I think that everyone should have high aspirations, and now we need to find a way to meet them. But there are many challenges to providing everyone with opportunities. Climate change is one of them. There's not a single African leader who won't tell you that the boot of climate change is on their necks. Recent episodes of droughts and flooding illustrate how things have changed, and we need to respond to those changes. Here are a few facts: Carbon dioxide levels in the atmosphere are the highest they've been in 800,000 years, 2017 was the second-hottest year globally since 1880, and 18 of the 19 warmest years on record have happened since 2000. Sea levels are rising at the fastest-recorded rate in 2,000 years. The Arctic is warming twice as fast as anywhere else on earth. In 2017, Arctic sea ice reached a record low for the third straight year. Whatever your views on the science of climate change, we are dealing with it every day, especially in the poorest countries. Other factors have impacted our ability to do our work. Fragility and conflict are affecting more and more people. Globally, the number of poor people in fragile countries has risen from 439 million in 2010 to over 2 billion people today. Conditions of fragility and conflict are highly correlated to famine. Today, 124 million people live in crisis levels of food insecurity. In conditions of famine, child mortality increases by about 60 percent. The average height for children under five – which measures stunting – falls two centimeters, and time in school drops by roughly 50 percent per year. At the World Bank Group, we’re trying to find solutions through innovative finance and technology to tackle these global challenges. One example is battery storage. Over the last few years, solar power prices have dropped precipitously. When I joined the World Bank Group in July of 2012, we were excited that we had achieved a cost for solar power that was 13 cents per kWh, not including storage. This year, however, the cost is just 2 cents per kWh. But now this is the problem: when the sun is shining, people have power. When the sun is not shining, they don't have power – unless they have also have battery storage. People in developing countries – like everyone else in the word – want power around the clock. Kids want to study. Families want to have light when they cook. We asked a very straightforward question: Why aren’t battery costs going down, and why aren't more countries purchasing batteries to provide power 24 hours a day? The answer is, there's not enough demand by developing countries. So, last week at the UN General Assembly, we announced that we will provide $1 billion for battery power in developing countries. That will mobilize an additional $4 billion – $1 billion from the various climate-related funds, and about $3 billion of private sector investment. For the first time in history, we will have $5 billion to increase demand and create incentives to bring down the price of battery technology. IFC has supported companies that have recently shown the ability to bring down the cost of battery storage from $300 a kilowatt/hour to $100 a kilowatt/hour, which can be an absolute game changer. When it comes down to $100 a kilowatt/hour, that means we can have solar energy – with storage – for about 5 cents per kWh. We are using our financing to create incentives in the market, so that we can continue to bring down the cost of storage and provide clean energy for all. Another example of how technology can tackle development crises is a partnership with Google, Amazon, and Microsoft that we recently announced to develop an artificial intelligence model that will help predict when and where a famine may occur. Famine is a persistent issue, but the larger problem is that we don't respond until it's too late. The power of this model is its ability to bring funding for humanitarian crises upstream, to prevent famines in the first place. It was the same problem we had during the West African Ebola crisis in 2014. As the crisis unfolded, nobody was providing any financing. Eight months into the epidemic, the international community had still not responded. If Ebola had gone to places like Karachi or Delhi, we might have seen it spread out of control. That’s when the World Bank made the first donation of $400 million to prevent the spread of Ebola. It was clear that we needed to find ways to disburse funding earlier. So, we worked with partners such as Swiss Re and Munich Re to create insurance against pandemics. The new system worked during a recent outbreak in the Democratic Republic of the Congo when we released $15 million from this instrument and helped stop the spread of Ebola at an early stage. At the same time that technology helps solve global challenges, it disrupts industries and jobs. The fear of machines taking our jobs goes back centuries. Karl Marx said in 1867 in Das Kapital, "The instrument of labor, when it takes the form of a machine, immediately becomes a competitor of the workman himself." For example, the Luddites, English textile workers protested against automation by destroying weaving machines between 1811 and 1816. E.P. Thompson, one of my favorite historians, wrote that, "Luddism was a quasi-insurrectionary movement, which continually trembled on the edge of ulterior revolutionary objectives." In Bangladesh, which has one of the most efficient and lowest-cost garment industries in the world, factory owners are buying something called sew-bots. A startup in Atlanta that makes these machines claims that a sew-bot can stitch a t-shirt in 22 seconds – about twice as fast as a Bangladeshi worker – and eventually at a lower cost. If automation takes over the garment industry, what are workers going to do? How will they support their families? How will they make their way in a world of uncertain economic opportunities and rapidly changing technologies? If aspirations rise and there are no opportunities, will we see uprisings? In so many ways, the Arab Spring was related to this issue. The Arab Spring was started by young Arabs in Tunisia and other countries who had a college education but very few job prospects. Are we going to see something like this again? I'm worried, because I'm beginning to see similar trends in many parts of the world. It turns out that the predictions on job losses are extremely unreliable. But we know that certain things are changing. Since 2001, the share of jobs requiring intensive cognitive and socio-behavioral skills has increased from 19 percent to 23 percent in emerging economies, and from 33 percent to 41 percent in advanced economies. Demand is growing for transferable, higher-order cognitive skills in all regions – skills such as logic, critical thinking, complex problem-solving, and reasoning. There are 4 million app developers in India, and China has 100,000 data labelers. Data labelers take raw data, clean it up, organize it, and prepare it for computers to use. The job requires strong language skills – describing an item in up to 12 words in a way that differentiates it from other items; and critical thinking skills – the ability to associate an item both within and across categories. That job didn’t exist before 2014. For a long time, the standard thought in development was that countries would go through the normal stages of industrialization – from agriculture to light manufacturing, and then to heavy industry. Certainly, Korea went through it. Many of the East Asian and South Asian countries are going through it now; however, this path may not be open for many developing countries today. Accelerate inclusive and sustainable growth, including building the foundations of the digital economy to help countries compete in the future. Foster resilience to global shocks and threats – including strong safety nets and social protection programs that focus on helping the poor. And invest more – and more effectively – in people to prepare them for the jobs of the future. First, build digital economies for inclusive growth. That starts with infrastructure, and no infrastructure investment is more important than ensuring broadband for all. The World Bank Group is crowding-in private sector capital to make affordable and reliable broadband infrastructure possible. For example, before 2009, East Africa accounted for 0.07 percent of the world’s international bandwidth capacity. That year, we brought together public and private partners to run a submarine fiber optic cable to link East Africa with global fiber optics networks. Later, we ran fiber optic cables to Central Africa and connected West Africa to Europe. The cost of broadband dropped by 90 percent, and with subsequent cables, capacity increased – first to several gigabits, now to several terabits. But we also know that broadband is just one of the foundations that countries need to build digital economies. Our Digital Economy for Africa initiative is also rolling out financial services, digital payment systems, and skills training programs in East and West Africa. We are also continuing to support basic infrastructure: more reliable energy, climate resilient roads, and railways. And because aspirations are growing so quickly, it is impossible to do this with aid alone. Official development assistance has gone up tremendously. But now, because aspirations are rising everywhere, there's no amount of official development assistance that will be enough. So, we’re focusing on facilitating the greatest sources of capital. Right now, there’s more than $6 trillion invested in negative interest rate bonds; $10 trillion in low-yield government securities; and $9 trillion sitting in cash, waiting for better investment with higher returns. If we could mobilize that money and bring it to developing countries to build infrastructure, especially broadband, they wouldn’t need to use government money. That would be transformative. Second, we need to foster resilient societies through social protection. In developing countries, especially in low-income countries, 90 percent of all workers are in informal jobs. In other words, they're not working for a company with benefits. Given the changing nature of jobs and skills, if other shocks are going to happen to the economy, how can we protect those people who are not linked to any formal job? This is one of the big challenges when we think of the societal effects of automation. Technology can actually broaden the reach of social protection programs and cash transfers – a strategy that we know works to raise productivity and resilience among formal and informal workers. For example, the Aadhaar Program in India uses state of the art biometric technology to make it easier for the poor to prove their identity and to authenticate the beneficiaries of dozens of social programs. At the same time, the government has been able to save billions of dollars by reducing fraud, a savings which more than covered the cost of the program. We have also seen how in six years, financial inclusion went from 35% to 80% with the biggest gains accruing to women and the poor, to a large extent driven by Aadhaar. Another example of technology to expand social protection is the use of electronic smart cards to support 125,000 Syrian refugee households in Lebanon. The cards worked so well that we stepped in to distribute them to poor Lebanese as well. Now, those economies are using smart cards in ways that we wouldn't have imagined before. None of these efforts will matter unless we invest more – and more effectively – in people. I have argued for a long time that we need more money for health and education. And it happened. But then leaders – especially Heads of State and Ministers of Finance – started perpetuating the notion that the responsibility for health and education is with the donors. This led to woeful under-investment in these critical sectors. We need to find ways to change incentives. How can we hold developing countries' leaders’ feet to the fire and convince them that they need to invest more? There is a global crisis of childhood stunting, which means that a child under five is two standard deviations below height for age. Brain scans from a study by Professor Charles Nelson from Harvard Medical School demonstrate the impact of childhood stunting on the development of neuronal tracts. Stunted children develop fewer neuronal connections during their first 1,000 days of life, a time period that is critical to building their human capital. The percent of children who are stunted is staggering: 45 percent in Pakistan; 38 percent in India; 36 percent in Indonesia. This is a medical emergency. When these children become adults, they won’t be able to compete in the new economy. Attacking childhood stunting is critical for economic growth. We analyzed longitudinal data from Indonesia and found that children who were stunted in 1993 demonstrated lower cognitive function in 2014 and 2015. Lower adult stature and cognitive ability was associated with lower adult earnings – in 2014, a person who was stunted in 1993 earned 12 percent lower monthly wages than those who were not stunted. The “stunting penalty” is 10.5 percent of GDP. That means that Indonesia’s per capita income is 10.5 percent lower than it would have been if none of its workforce had been stunted in childhood. The overall stunting penalty for the East Asia and Pacific region is 7 percent of GDP; for Africa it’s 9 percent of GDP. We also know that education systems are falling behind. Half of primary school children in developing countries are still failing to achieve minimum proficiency in reading, writing, and basic math; 264 million children are not in school. In a survey across seven countries in Sub-Saharan Africa, which represent about 40 percent of the continent's population, one-third of teachers had not mastered the fourth-grade language curriculum that they were teaching. And in Mozambique, Nigeria, and Togo, half of the teachers hadn't mastered the curriculum they were there to teach. This also matters for economic growth. On average, one additional year of schooling yields a 9 percent increase in lifetime earnings, and the returns are even larger for girls. What can we do to help countries invest more – and more effectively – in their people? We decided to do something called the Human Capital Index, which ranks countries in terms of the quality of their investment in human capital. When the World Bank publishes rankings, they are always controversial. But we want every single country to begin debating the quality of their investments in people. Survival: Will children born today survive to school age? School: How much school will they complete and how much will they learn? Health: Will they leave school in good health, ready for work and with the foundation for lifelong learning? We’re focusing on outcomes, not inputs. And, looking backwards, we found that investments in people – to improve outcomes in health and education – were far more correlated with economic growth than we ever thought. And with the pace of innovation accelerating, it’s a safe bet that those correlations will only get stronger in the future. Finally, underlying these pathways is the need for both private and public innovators to design technology that helps create equality of opportunity for everyone, especially the poorest. It starts with technology that creates jobs: Bangladesh contributes 15 percent to the global labor pool online by means of its 650,000 freelance workers. Taobao Villages, which connect self-employed shop owners to the Chinese online marketplace, have created more than 1.3 million jobs, drawing young people who had migrated to cities back to their hometowns to start their own enterprises. With LinkedIn, we are creating a new data dashboard that will use all of the insights from LinkedIn’s 562 million users to help policymakers, companies, and individuals understand the skills and occupations of the future. This will help governments identify skills that are in demand, expand industries and develop training programs to support them. Digital platforms can be designed to disrupt the gender divide and help make the global market system work for everyone. We’re working with Airbnb to study the impact of home-sharing on rural communities and on women, who make up the majority of hosts on the platform. Tourism comprises one of the largest job-rich service industries in the world. It is a sector that will likely grow in today’s era of disruption. We still need a better understanding of how sharing economy business models can reduce inequality. We need to build technology where the poorest and the most vulnerable are part of its core architecture—where human solidarity is stamped into the DNA of every new innovation. In the push for growth, both in terms of sales and a country’s GDP, would your innovation shift capital away from poor communities to wealthy ones? In the search for efficiency, does your platform erode social safety nets? In the name of progress, what parts of economies and societies will be disrupted, and how prepared are they for that disruption? Before you think about revenue or growth, ask, is it going to work for the poor? Before you track your runway and burn rate, before you go down Sand Hill Road and look for your Series A funding, you have to think about, "Who is it for? Who is it going to benefit?" Before you apply for a patent or present your idea in a paper – think about the philosophy of your technology and how your idea can do more good – and also, do far less harm. for Kalu Ram and Kherun Nisha in India; and, most importantly, for the Alimata family in Burkina Faso; who, along with more than 700 million others, still live in extreme poverty. There are billions like these three families around the world. At least in part because of the great technology that was built right here in Silicon Valley, their aspirations are rising. And just like everyone on earth, they deserve security, dignity, and the opportunity to succeed. This is very personal for me. I was born in 1959 in Korea, when it was one of the poorest countries in the world. This is what the World Bank said about Korea in 1963: "Korea will find it difficult without foreign aid to provide its people with more than the bare necessities of life." They wouldn’t give Korea even the lowest interest rate loans because they didn’t think the country could pay it back. But, of course, Korea defied all of those predictions, and the World Bank got it wrong. You have to be optimistic about every country, and optimism, in this case, is a moral choice. Optimism is at the core of my story. My mother and father were both refugees. My father was a refugee from North Korea. My mother was a refugee during the war. And through the kindness of strangers, they came to study in the United States. My father had gained entrance into dental school, and an American Army dentist brought him to New York City to study periodontics. My mother was one of the top students in her high school, so a women's society in the U.S. called P.E.O. gave her a scholarship to come to the United States. There were only a couple hundred Koreans in the city then, and my parents met there and married. The point is, my parents were among the few Koreans in 1959 who had seen what it was like to live in the United States. They were some of the few Koreans whose aspirations had been raised. Last year, I visited a school in Tanzania. As I often do, I asked the students, "What do you want to be when you grow up?” Two students raised their hands and said, "I want to be President of the World Bank." My staff and the teachers laughed. But I said, "Wait a minute, back in 1963, when I was a preschool student in one of the poorest countries in the world, if George David Woods, the President of the World Bank at the time, had come to Korea and visited my school, I doubt that he would have thought that one of his successors was sitting in that classroom." The point I want to make is, don't let anyone ever tell you that your dreams are not possible. But for Tanzania, they're behind. More than a third of children are stunted; their education system provides about half of the learning per school year as the best systems in the world; and most sobering of all, the path to development that Korea and so many other high-income countries followed – agriculture, light manufacturing, heavy industry – may be closed to them. 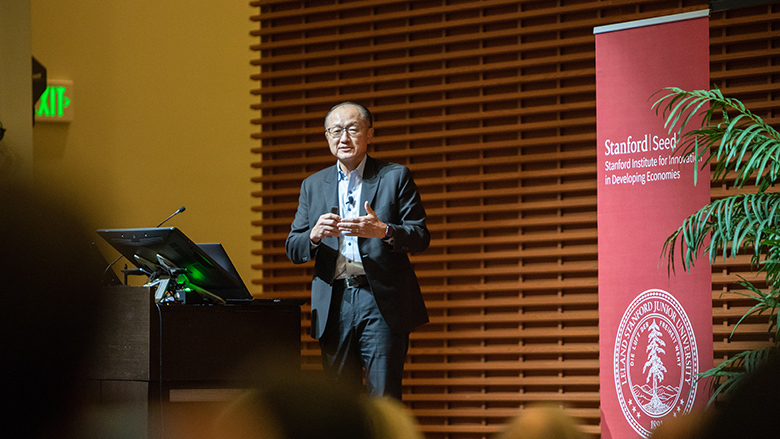 The greatest hope of those students may be the technology that you build right here at Stanford. Do your best to ensure that the philosophy of your technology includes those children in Tanzania. Think about what it means for the poorest. I believe that we can harness technology, and in doing so, we can make the global market system work for all people and the planet. We can give Tanzanian children and everyone – everywhere on earth – a chance to reach their highest aspirations.